The racing season has at long last started. We haven’t been just sitting around just pinning for race day. We have been very busy working, while pining for race day. Last season the animal motor spun its bearings and died. We had a new one built using some of the parts from the LO206 motor we blew up at the last years first race. Jason has been practicing at K1 Speed and has now moved up from their small karts to the adult karts. I have been inspecting and repairing lots of little things on both karts as well as adjusting the karts to accommodate Jason’s growth over the winter. 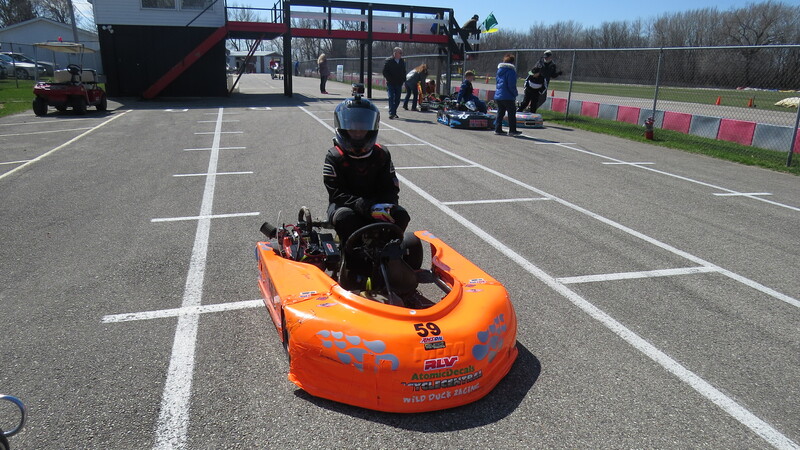 The LO206 kart remained mostly the same just a bigger seat, while the Animal kart kept is seat but got bigger tires, more weight, and a more powerful motor from Regan at 4 Cycle Central. The racing weekend started with some hockey practice, then Jason and I headed up to Badger Kart Club for their first race of the season. As a bonus Karen and Katie would meet us at the track. 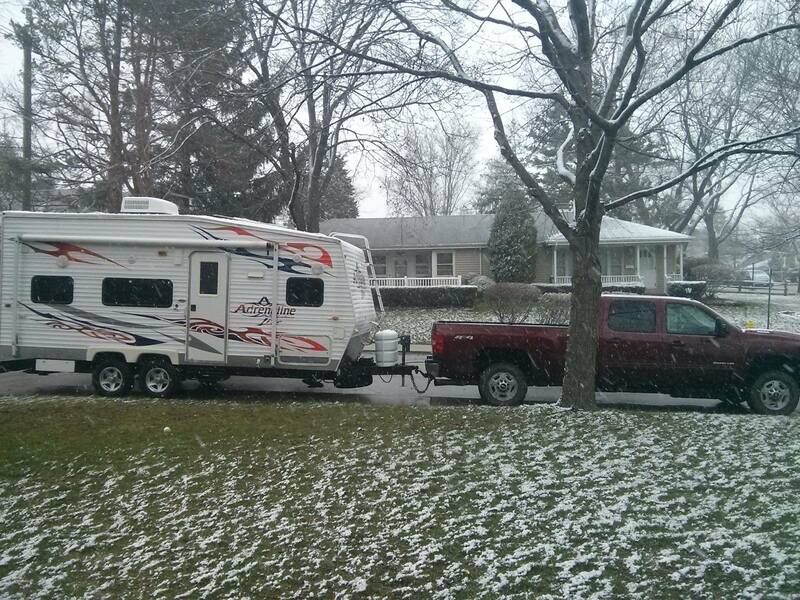 Karen was towing our old trailer to deliver to its new owner. I was hauling the new to us toy hauler with a, also new to us, pickup. It was a cold and SNOWY(!?!?) day. I managed to get the 206 kart ready for Jason to get a few rounds of practice in but they were very short due to freezing hands. The rest of the night was spend in the trailer hanging out and keeping warm. The warmth lasted till about 8 pm when the trailers heater stopped working. Thankfully, our friends the Murray’s live near by and brought us a space heater for the night. Sunday’s race day started early with some last minute work(and snow) on the animal kart to get it road worthy. Badger has moved to a single practice format and added laps to the races. This is great for racing but makes fine tuning the setup a challenge. During the LO206 pracatice the kart took some damage as he was collected some novice drivers crashing in the hair pin, but was repaired with lots of orange Duck Tape just like NASCAR. The Animal, on the other hand, was having handling issues and the break caliper too tight. Most of my time was spent working on itto get the brake to stop rubbing and then repairing a broken brake line. It was finally fixed by adding some washer as emergency shims. The LO206 ran very well and Jason brought home second all day long with some excellent driving. He led the feature for most of the race but the local favorite was able to catch him. There was a puckering 3 wide pass in the hair pin involving Jason, the leader and lapped traffic, all made it out clean. The kart just needs some fine tuning and seat time to run out front again. The animal kart is another story. 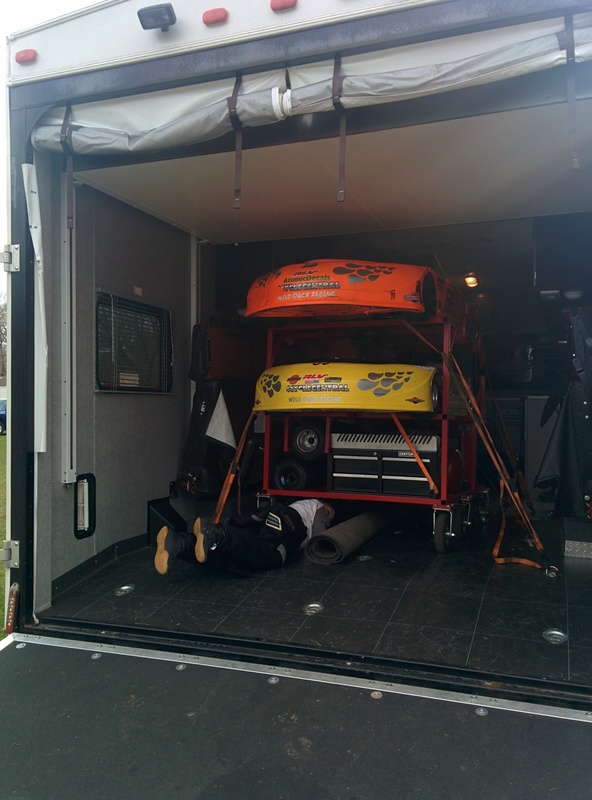 The kart was reconfigure with more weight to run the Jr class and was out of balance and over weight by 22 pounds. Fixing the weight made the kart more out of balance and hard to turn right. The breaks are better but need some TLC to be perfect. The feature race was exciting from the stands and there was smoke coming from brakes, later it was discovered that number plate was rubbing the break disk and smoking. It will be a challenge this week to get kart balanced correctly in just a few hours of work each night. Despite the wacky kart Jason met some luck and finished second due to two other drivers falling out due to their own mechanical issues. 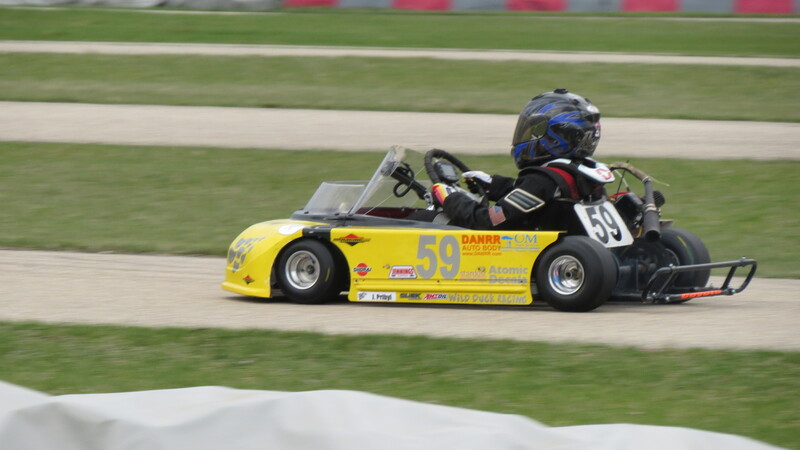 Jason’s next race will be this weekend at the Mid-State Kart Club in Springfield, IL for the Mid-American Sprint Series’ first race of the season. The races at Badger last weekend were rained out, but we did get some practice in on Saturday and the Animal kart is starting to shape up. Some more seat time and tuning should get it right. Thanks Marty Murray for preventing our untimely frozen demise and doing technical inspection for both CES and Badger. Karen and Katie it great to have you around cheering us on and lending a hand. Reagan of 4 Cycle Central saw the problem with the sticky brakes and built a great Animal for the season. This entry was posted in Race Results, Racing, Sponsor by ChiefDuck. Bookmark the permalink.